Holiday Gifts - Without the Waste or Clutter! There’s been so much going on in the world and in our lives that the holidays really snuck up on me this year. Do you feel the same? If so, you may think you need to rush online and buy a bunch of gifts to cross that task off your list. I mean, most of us don’t have time to come up with creative gift ideas. But this rush to buy stuff is a trap, isn’t it? We spend a lot of money just to have something to give. And what happens after the holidays? We’re left with mounds of trash and a bunch of stuff we don’t really need or want. Things received as gifts are difficult for people to give away, even if they don’t love them. We tend to feel guilty about getting rid of things that were given to us by people we care about. So what happens? We put it on a shelf, in a closet or in the garage, and there it sits. It just creates clutter we will have to deal with eventually. You don’t have to be part of that cycle, though! With a little extra thought, you can give gifts that won’t create waste, guilt and clutter. You don’t know what to give, you say? Well, don’t despair, because I’ve done the work for you! Below is a list of low waste and eco-friendly gifts and stocking stuffers to suit any budget or recipient. Experiences are the ultimate zero waste gift. You may think of sky diving or vacations when you think of giving an experience, but they don’t have to be expensive! Below is a list of experience gifts ranging from budget to extravagant. - Go out for coffee, ice cream or a drink. - A hike or picnic. - Ice skating or roller skating. - Go to the movies or bowling. - Lectures – look at the calendars of your favorite organizations. - Night life events at local museums. - Tours – play tourist and get tickets for a double decker bus tour or a themed walking tour of city neighborhoods. - Batting cages or driving range. - Comedy show for two. - Mini golf, laser tag, ziplining. - Museum visit for two. - Yoga or workout class passes. - Theater tickets for two. - Escape room tickets for two. - Opera or symphony tickets for two. - Sporting event tickets, minor league or budget seats. - Tickets to a major sporting event. - Vacation – a week or weekend away. - Cycling tour for two. - Chef’s Tasting Menu for two. 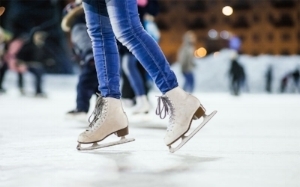 Ice skating in the park is one of our favorite holiday funday activities. These are always a hit – who doesn’t love an indulgent treat? Just pay attention to packaging. Whether you make it or buy it, strive to choose sustainable and reusable packaging like glass, paper etc. Homemade is awesome, but if you’re out of time or it’s just not your thing, visit a store with a good bulk bin selection and use mason jars to pack them as gifts ready for giving. - Chocolate or candy, homemade or bought in bulk or paper. - Cookies or other baked goods. - Spice or herb mixes. - Loose leaf tea or coffee beans. - Brownie mix, hot cocoa mix, cookie mix, soup mix, make it or buy it in bulk, then pack it in jars with instructions and tie with ribbon or string. - Homemade vinegar, mustard, vanilla, jam, preserved lemons, hot sauce, caramel sauce… the possibilities are endless! - Homemade bath salts, sugar or salt scrub, lip balm, dry shampoo, face mask mix only take minutes to make but are so luxurious. - Bulk bin or homemade snacks like popcorn, nut mixes, roasted chickpeas, wasabi peas, salty snack mixes. 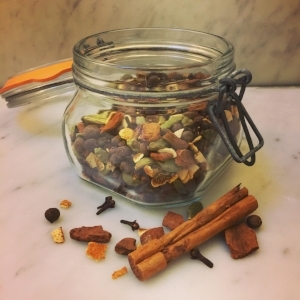 We love this mullling spice mix from the bulk bins - it smells so good! - Soy or beeswax candles. - Stainless steel safety razor and refills. - Wine, beer or liquor. - Vintage or second hand gifts in excellent condition. - Gifts made of natural materials like wood, metal, paper, leather, wool and with minimal or no packaging. - Battery charger and rechargeable batteries. Here are some cute zero and low waste ideas for stocking stuffers our family enjoys. - Phone case from Pela Case (pelacase.com), beautiful, durable, sustainable and 100% compostable. They also give to organizations that keep plastic out of the oceans. - Oranges, mandarins, pomegranates, or another seasonal goodies. - Silk floss is renewable and compostable. Dental Lace (dentallace.com) makes a zero waste version that comes in beautiful, refillable glass tubes. - Bamboo toothbrushes are renewable and compostable. - Organic cotton or bamboo socks. - Plastic free hair ties like the natural cotton and rubber ones from Kooshoo. - Stainless steel tea strainer, loose leaf tea. - Wooden toys like a Jacob’s ladder, carved animals. I hope this list helps you and your loved ones find gifts you feel good about giving and receiving. Have fun, be creative and enjoy a wonderful holiday! It’s that time of year again! The sun is shining, flowers are blooming and Daylight Savings is giving us a headache. In other words, spring is here! With longer days and spring fever kicking in, a lot of us feel the urge to do some spring cleaning. This year, in addition to cleaning and straightening, consider reducing as well. In the spirit of spring cleaning, let’s talk about reducing our belongings – or purging or decluttering – whatever you want to call it is fine. Reducing is one of the most satisfying things about getting organized. When you reduce your belongings, everything becomes easier. You have fewer things to clean and organize. When you open your closet, instead of standing there trying to figure out what to wear, you can easily choose from pieces you truly love because they flatter you and fit your style. When you open your bathroom cabinet, instead of pawing through a mass of products, you simply pick up the one thing you are looking for because you’ve removed the excess and what’s left is exactly what you need. Reducing simplifies your life by saving time and eliminating the stress associated with sorting through too much stuff. In addition to making your life easier, you also release your things for someone else’s use. For example, that slow cooker you bought but only used once? It can now be used by someone who otherwise would have purchased a new one. This is another benefit of reducing: you reduce the waste associated with the production, packaging and shipping of new products because you have allowed someone to buy used instead. So, how to get started? I suggest starting with your clothes. This is the easiest type of item to reduce. Collect every item of clothing and put it in one place. Pick up each item and decide: do you truly love it? Does it make you happy, or as the tidying expert, Marie Kondo, says, does it spark joy? The trick is to decide what to keep rather than what to get rid of. You don’t have to think too much about how often you wear it or anything like that. Just pick it up and pay attention to how you feel when you touch it. Do you smile? Do you think about how wearing it makes you feel good? Do you feel nothing? Do you feel guilt? Use these impulses to make your decision. Only keep the things that make you happy. Don’t keep things out of guilt! You don’t need to feel guilt when you open your closet every day! 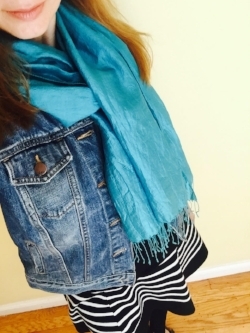 Out the door in a flash - thanks to a tidied and clutter-free closet! When you decide what you love and want to keep, you just release the rest. It’s that easy! Make three piles: keep, donate or sell. You can skip the sell pile if you don’t want to deal with this step, but if you have expensive pieces in good condition you may want to consider selling, trading or consigning them. Once you have made your decision about what to keep, you can organize. There is no point in organizing without reducing. The mess will just come back if you still have too much stuff. After you have reduced and organized, you will find it is much easier and faster to get dressed in the morning! You won’t have to stare at your closet, searching for something you feel like wearing because you know everything in it looks good on you and makes you happy. You will also have less laundry to do! Your closet will give you a sense of peace and calm rather than frustration. To keep your closet organized, apply the same process before deciding whether to buy something. Instead of buying on impulse, think about each purchase. Does it truly flatter you? Do you feel happy when you try it on? If not, don’t buy it! Also, try to buy used clothing when possible. Clothing takes a lot of resources to produce: oil, water, pesticides, etc., and it also produces water and air pollution during production and shipping. This is coming from someone who used to binge buy clothes so believe me, it is totally possible to make this change. Happy spring and happy reducing! Our Advent Calendar, made of saved tp rolls, numbers printed on reused paper, kitchen twine & a pine branch from the backyard - and filled with bulk bin malt balls. The Thanksgiving leftovers are gone, the days are shorter, the nights are colder, lights and decorations are everywhere you go, and everyone is talking about travel and gifts and celebrating. The holiday spirit is in the air. I love this time of year. The change in the weather, comfort foods, baking, decorating and gathering with friends and family… I look forward to all of it. However, at this time of year we’re also bombarded by ads and marketing and temptation to buy stuff everywhere we look. Create the “perfect” holiday by choosing the “perfect” gift, they tell us. But is it true? Do we really have to buy more things to create a memorable experience? The National Retail Federation reports that the average American consumer will spend $967 on the holidays this year. That’s just the amount people plan to spend on holiday gifts and décor! Not only do we spend a lot of money on the holidays, but we also produce a lot of garbage. Americans produce 25% more trash between Thanksgiving and New Year’s Day. That’s 1 million tons in just two months! So, what to do? How can we consume less during the holidays and still celebrate? Well, I can tell you what our family does and maybe some of our ideas will work for you. Let’s face it. Decorating is a major part of the holiday tradition. There’s a good reason for this, too! As the days get shorter and colder, we crave the comfort and warmth of twinkling lights and beautiful things. It helps us create something positive during what can be a challenging time – and for many it is a very difficult time of year. I fully embrace decorating for the holidays, but have found ways to do it that don’t create waste and still bring us joy. Use what you already have. You likely have everything you need to decorate for the holidays. In fact, most of us have more than we need! You can probably even downsize. Keep only what you really love and give away the rest. Bring nature indoors. The most beautiful decorations often come from nature. Pinecones, branches, seasonal produce, spices like cinnamon and anise, nuts, wood, cotton, wool… if you can eat it or compost it, it’s a good choice! Speaking of nature, if you get a tree, opt for a real tree instead of a fake one. If you already have an artificial tree, go ahead and keep it, but don’t buy a new one. Fake trees are made of plastic, a non-renewable resource, and kept for an average of 7 years, then end up as landfill. Real trees clean the air while they grow and are compostable. Even better is renting a living tree, which can either be returned to the nursery at the end of the season, or planted outdoors. You can even use a potted tree or plant to decorate, or search online for tree-less ideas. There are so many creative ways to make a tree-like decoration using lights, ornaments, even chalk on the wall! If you still feel like you need something to add to your décor, buy second hand. Antique and thrift stores are great places to start. Craigslist and eBay are perfect if you’re looking for something specific or hard to find. We used to take a family photo every fall and had beautiful cards made to send to friends and family. It was expensive and time consuming, and people probably displayed them for a few weeks and then threw them away. Now we make a fun video or take a picture and email it to everyone. More people are included this way and there is no waste. Gifts are practically synonymous with the holidays. But there are lots of gifts that you can feel as good about giving as the recipient will feel about receiving. Vintage gifts are zero waste, unique and special. Activities make a wonderful gift. Not only do they bring happiness in the moment they’re given, but they can create memories to share. You can offer to host an activity to do together or give a gift certificate for the recipient to use on their own time. Homemade and consumable gifts are always a good choice. We give homemade gifts every year and try to come up with something different each time. Some ideas are homemade jams or preserves, spice mixes, dough ornaments, condiments, infused liquors, candles, frames, body scrub, etc. If you’re not particularly crafty, visit a store with a bulk department and fill some nice jars with teas, spices, bath salts, or whatever you like. Playing catch on the beach with his dad the day after Thanksgiving - much more fun than shopping! When it comes down to it, what’s really important is spending time with people we care about. When our family talks about the holidays, the things we remember are the things we do together. Whether it’s going out to look at holiday lights, ice skating, visiting the amazing hotel holiday displays or making a fondue dinner with candles and firelight, the most important thing is the feeling we get from sharing a moment with people we love. The holiday season is upon us. The days are getting shorter and we start to long for the cozy feeling we get from spending time with friends and family. Many of us enjoy the holidays, but did you know that American homes generate 25% more trash between Thanksgiving and New Year’s Day? That’s an extra 1 million tons! I’m here to tell you this extra trash isn’t necessary. With a few new tips and habits, you can have a festive and beautiful holiday without the extra garbage. Focus on homemade rather than store bought. - Buy from the bulk department using your own bags or containers. o Rice, grains, nuts, flours, dried fruits, beans & legumes, cereals are available in bulk in most areas. - Buy fresh fruits and vegetables using your own bags (you can even wash and reuse the plastic produce bags from the grocery store). - Prioritize local and seasonal produce. The farmer’s market is an excellent way to do this without having to think about it too much. - Many butchers will put meat in your own container. If they refuse, ask them to skip the plastic bag and wrap in paper only. I always use a separate reusable grocery bag for meat and fish, just to be safe. And do wash those reusable grocery bags, please! - Save those scraps! Veggie and meat trimmings can be used to make stock, and the stock can be used to make soup, gravy or as a base for adding flavor to dishes. Compost the solids after making stock. - Ask guests to bring their own containers if they want to take home leftovers. Or if you prefer, pack the leftovers in glass jars. Start collecting them in advance so you will have enough. - Speaking of leftovers, make sure to use them! Don’t let all that hard work go to waste. If you have trouble using them in time, put them in the freezer (once again, glass jars are perfect for this). - Skip the foil and plastic wrap. Put leftovers in containers with lids or cover the dish with a plate. If time or other limitations prohibit homemade, bring your own containers with lids to the prepared food counter. - It is safe and legal for them to put prepared food into your own clean container, though it’s prohibited for them to refill dirty containers. - Decorate with nature. Those pumpkins from Halloween can be repurposed for Thanksgiving. We also like to add whole nuts, pomegranates, apples, pinecones and interesting looking edible squashes for the table. Add pretty sticks and leaves as accents. After Thanksgiving, eat the produce – yum! - Leaves can be used as place cards. - Use real stuff: cloth napkins, tablecloths, glasses, plates and utensils. It’s waste free and much, much prettier! If you don’t have enough, borrow from friends and family or head over to a thrift store to stock up. - Make it a “buy nothing” day instead. - We like to play hometown tourist on Black Friday – visit a local landmark, go to the beach, take a walk in a new neighborhood… there are so many things to do! - Volunteer to do something that helps others. o There are a lot of volunteer opportunities, especially during the holidays. Hospitals, food banks, soup kitchens, animal shelters… they all welcome volunteers. o Even if you haven’t signed up to volunteer in advance, you can do something in the community like pick up litter on the beach or in your neighborhood, offer to help an elderly or disabled neighbor with errands or chores, donate money or stuff to those who need it. - If you give gifts for the December holidays, consider using the day after Thanksgiving to make homemade gifts. o It can be food, arts and crafts or whatever you like. This year, we’re making red wine vinegar and homemade mustard. Last year, we made pickled vegetables. The year before, we reused little glass yogurt containers and planted them with succulent cuttings. Other ideas are jams or preserves, condiments, infused liquors, candles, frames, body scrub, etc. o If you aren’t particularly crafty, that’s ok too! Visit a grocery bulk department and fill small jars with teas, spices, bath salts, or whatever you like. Tie it with a little twine and you’re done! With just a few changes to your normal habits, your holidays can be just as meaningful, if not more so, and you will have a lighter footprint on the planet. And isn't that the best gift you can give? Can you feel it? Fall is in the air. At our house, that means Halloween is coming! Costumes, pumpkins, decorations, candy… it’s all part of the deal. Retailers estimate Americans will spend over $6.9 billion on Halloween this year – and most of the stuff people buy will be used once and then thrown away, along with its packaging. But, just because Halloween is here does not mean you have to spend piles of money and generate even bigger piles of garbage. - Hit the thrift store. Have some ideas in mind to help guide you, but be flexible and open to inspiration. - Shop your home. Look at what you and your family already have in your closets and storage. - Repurpose old costumes - use your imagination to mix and match pieces from Halloweens past to create something new. I have been using the same black wig on and off for years and am using it again this year. - Borrow from friends. They probably have costumes kids have outgrown or stuff they won’t use again. - Organize a costume swap. Similar to borrowing from friends, but more people can participate and there’s more variety. Part of the fun of Halloween is decorating, especially in our neighborhood. But it’s not necessary to run to the Halloween store to buy a bunch of stuff you’ll use once a year and have to store for the remaining 11 months. Now, I’ll be the first to admit that our family has a box of Halloween decorations from the years before going Zero Waste and we do use them. But we have committed to not buying any new decorations and have stuck to that commitment for the past five years. - Pumpkins and squashes. Bonus: you can eat them after Halloween is over! Make soup, toast the seeds and serve them at a party. - Branches, leaves and pinecones (we love to collect branches with interesting moss and lichen on them – they make fantastic decorations). - Repurpose household items to make your own – get creative! 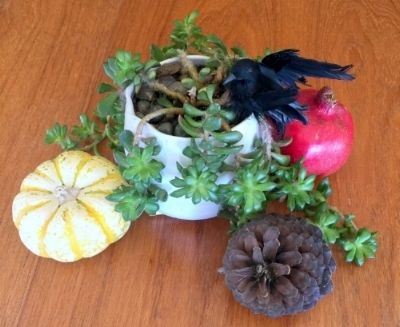 Halloween themed centerpiece created using our existing plant, a tiny pumpkin, a pomegranate, a pinecone we found at the park and a black bird I saved from a Halloween years ago when I dressed at Tippi Hedren from "The Birds." - Trick-or-Treat up and down your street or around the block instead of through the entire neighborhood. - Encourage kids to choose plastic free treats – paper or cardboard wrapped candies, fresh fruit, pencils, etc. Definitely ask them to avoid plastic toys. - Use a cloth bag, an old pillowcase or a basket or bucket from your home instead of buying a new bucket or bag for trick-or-treating. - Have your kids select treats to keep, then encourage them to take the rest to a Candy Buy Back program. Many dentists offer this after Halloween. They pay your child by the pound and then donate the candy to troops overseas. - Drinks: serve mulled wine or sangria for adults; for kids: apple juice (spiced or not), from a glass bottle – no juice boxes, please! - Serve finger food to cut down on the need for plates and utensils. Search online for “zero waste Halloween” for fun ideas. - Serve it all with real glasses, cups, plates and utensils. You can use a washable crayon or pen to mark glasses and cups. Our family has always been pretty environmentally conscious. We bought organic produce and natural products. We recycled everything we could. We composted every scrap of food. I was proud to live in San Francisco, a city that shares my values. Our town even provided us with compost bins! How many places do that? I thought we were doing a really good job. Still, I was disappointed each week when our recycling bin was full to the rim. Most of it was plastic food containers and boxes from ordering stuff online. I had read that a lot of the plastic we put into the bin wouldn’t end up being recycled, but I didn’t know what to do about it. Then I read about the Johnson family in Marin, who had reduced their trash to just a quart a year. As I read about their practices and habits, a whole new world opened up for me. We were not powerless over the amount of waste we produced after all! We started making changes and followed the 5 Rs: Refuse, Reduce, Reuse, Recycle and Rot. Refuse means to say no to things we don’t need, whether it’s free swag giveaways, samples or buying something. Reduce means we get rid of the things we don’t love, use or need. We release them to free up space in our home. Reducing also enable others to acquire our unused stuff instead of buying something new. Reuse means that when it makes sense, we repurpose something instead of throwing it away or buying a new item. Recycle refers to recyclable things that can’t be refused, reduced or reused. This includes paper and cardboard, glass, metal and plastic. Rot is the last option, which means compost what cannot be refused, reduced, reused or recycled. If it is organic material, it goes into the compost. If you follow the Rs in order, you’ll be able to reduce your consumption and as a result, you will definitely reduce the amount you put into the landfill. It’s ok to make changes gradually and it’s ok if some changes don’t work for your family. Every bit counts! By following the 5 Rs, our family has been able to reduce our trash by about 90% and our recycling by about 75%. Reducing our waste has so many benefits. Not only do we keep trash out of the landfill, but we use fewer resources such as oil, energy and water to make, package and ship new products. We also end up spending a lot less money in the process. Invest in a reusable water bottle and a reusable travel/coffee cup. Get into the habit of filling your water bottle before you leave the house and bring your travel cup to the coffee shop. Or, if you have time, ask for your coffee or tea in a real cup and sit down to drink it. Put together a little napkin and utensil set to carry with you so you don't have to use plastic utensils when you're out. This is as simple as taking a fork, knife and spoon and rolling them inside a cloth napkin, then tucking it into your bag or putting it in your car or your desk. When grocery shopping, bring your own reusable bags, including bags for produce. Bring a few clean food containers and use them to stock up on dry goods from the bulk bin rather than buying pre-packaged items. If you entertain guests at home, start building a collection of reusables to replace any disposables you use for parties. We host parties frequently, so I bought things like glasses, cups, plates and flatware gradually. Shop thrift stores, garage and estate sales and Craigslist to find deals. My collection of 40 forks and plates we use for parties only cost a few dollars at the thrift store. Our collection of stainless steel cups was a bigger financial investment, but I built it gradually and now we use them all the time. That’s how we did it, but in the end, it’s up to you to decide how to replace disposables in a way that works for you. Do a little spring cleaning in your closet. Go through every single item and keep only the ones you really love and wear regularly. Donate the rest. (No cheating! Don’t wear it tonight just so you can say you use it!) After you tackle your wardrobe, you can move on to other areas of your home and office. I love the KonMari method for decluttering. It changed the way I approached the task and allowed me to be much more efficient. Keep those glass jars from the grocery store. Clear one shelf to store them and use them to keep leftovers. You can also bring them shopping with you to buy from the bulk bins. You just have to write the weight of the jar down before you fill it. I use a washable crayon and write directly on the jar, but you can also enter it into your phone. If you have kids, there is probably a lot of paper that comes home from school. We hang really special projects on a bulletin board for a short period, then we either recycle or reuse them. One sided paper can be made into notebooks. Drawings can be used to wrap gifts or to make cards. Little things like googly eyes can be removed and reused in future art projects. We occasionally buy flavored yogurt in small glass containers. Last week, we planted succulent cuttings in a few of them. A friend uses them as juice glasses. If you do buy things in plastic containers, don’t recycle them; reuse them! Wash them and use them to keep leftovers or even to pack food for lunches and snacks. Plastic produce bags can be washed and reused on your next grocery run. Before you toss something in the recycle bin, think twice. Can you reuse it? You probably can. If you simply cannot figure out a way to reuse a recyclable item, then put it in the recycling bin. Check locally to figure out what is recyclable in your area. If you can’t Refuse, Reduce, Reuse or Recycle it and it’s food or organic matter (like wood chips, soiled paper, garden cuttings, etc.) then it can Rot. Put it in the compost bin. If your city doesn't collect compost, you can start your own compost pile. If you have a yard, it's easy to make or buy a small compost box. Then you can use the compost in your garden. Even if you live in an apartment, there are small composters that can fit on your fire escape or under your sink - and they don't smell. What do you do to reduce your waste and consumption? Share with me in the comments.